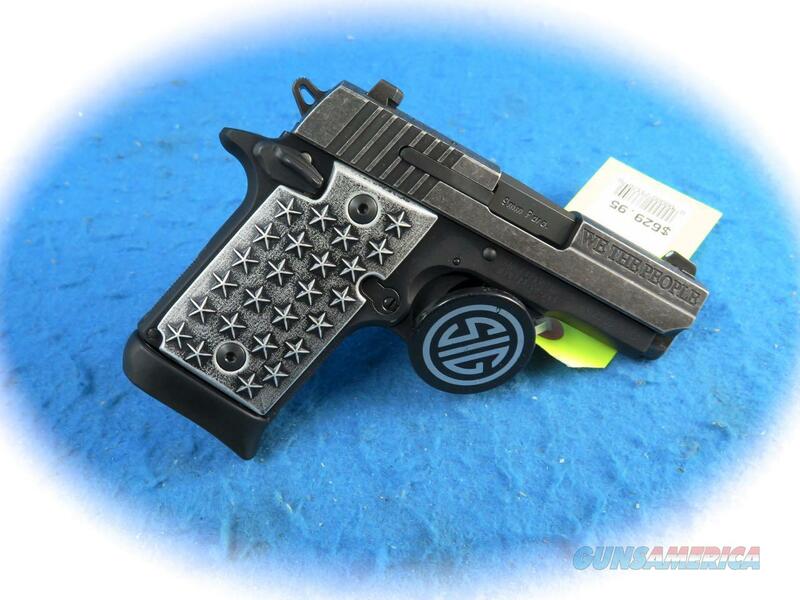 Description: Sig Sauer P938 Micro Compact "We The People" 9mm semi auto pistol, Model 938-9=WTP. Commemorating a rich patriotic history, this pistol serves as a fitting tribute to the Second Amendment and SIG SAUER's premier conceal carry platform. This uniquely-American pistol features custom aluminum grips adorned with 50 stars (25 per side) that represent each state in the union. A distressed finish on the stainless-steel slide includes patriotic engravings, such as 13 stars atop the slide and “WE THE PEOPLE” on the slide flats. The single-action trigger gives the P938 unmatched accuracy in a pistol its size. With dimensions just slightly larger than its .380ACP counterpart, the P938 packs seven plus one rounds of 9mm. While it honors the past, We The People is fully equipped for modern day use, with an ambidextrous safety and low-profile high contrast sights. Regrettably, we are not able to offer trade-in’s on our internet sales, however we do consider trades in our retail location.